Here is my completed English-style woodworking bench. It’s southern yellow pine with walnut dowels (Miller 2X) finished with boiled linseed oil. The top is 2.5 inches thick as is the front apron. It weighs a ton and it’s rock solid. I put virgin rubber treads (made from the soft material used under rugs to keep them from sliding on hardwood floors) under the legs so it won’t slide on the smooth floor. I just installed the Veritas twin-screw vise as an end-vise. It has round dog-holes made with a 3/4 inch brad point bit on the apron, tops and in the moveable jaws. They work well with hold-fasts and round bench dogs. I’ll have to add a leg vise down the road and made the bench to accept either the Lake Erie wooden one or the benchcrafted. If anyone has an opinion of which one is better for the cost, please let me know. Right now I’m using the bench to put the finish on a walnut coffee table that on which I have been working and cannot wait to start some new projects with a proper workbench. I would recommend this design to anyone considering a new bench as it’s fairly simple compared with some of the other designs out there. Including prepping the construction-grade lumber through installing the end-vise, I have about 64 hours into it. Nice looking bench … inspired by Paul Sellers? I have been watching Paul Sellers building one of these. Yours really looks great. Where did you find the plans? I need to build one like yours. I think the price is in my ballpark. Really well done! Forgive me, but I did not know who Paul Sellers is until I googled it just now. I have added his site to my favorites as I love to read and watch what the real professionals are doing. 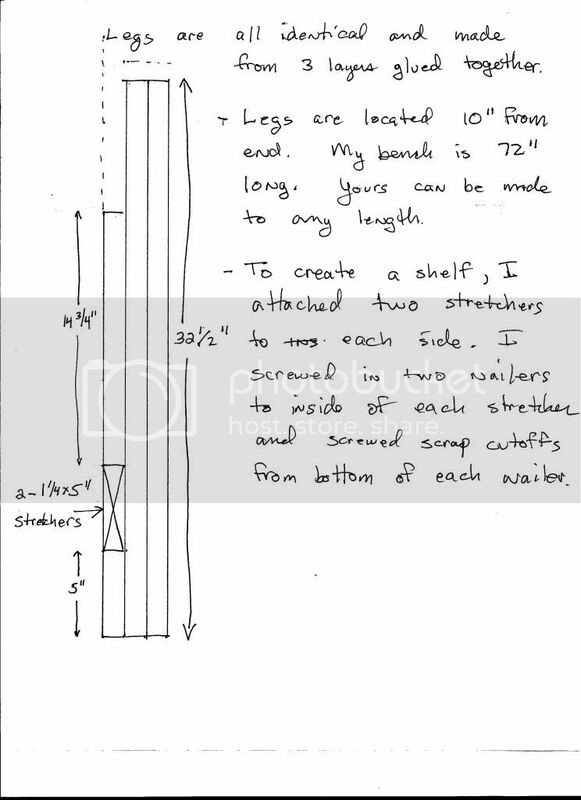 Bill, I made my own plans based on pictures of other similar benches on the web and in one of Roy Underhill’s books. I also factored in the size of lumber that I could find and afford. I couldn’t justify the cost of maple or another suitable hardwood for what is one of my hobbies. (I also collect timplate trains and my budget is not unlimited. :( ) Let me know if you are really interested and I will scan my homemade plans. Tim, your bench is awesome, looks really great and mostly affordable at the same time. I would love to have a copy of your plans if you would not mind and can find the time. I plan to start on my bench in the next month or two. And I already have some pine 4×4s that I plan to use on the frame. It looks like you did the same. I love the work that you put into that AWESOME looking bench. Very nicely done. Man you made that SYP look nice! Great job! that is a very very nice bench…. Nice piece of walnut you have there aswell. I look forward to seeing the coffee table on lumber jocks soon too. -- Englishman in Finland I am guessing that i am Finglish. I really like this bench too! Great job! I will second what has already been said in that I like that its made with construction grade lumber so affordable! I might just have to look into this bench as replacing mine! Thanks for posting and letting us all see it! Really nice job on the new bench! I wish I could get syp in my area. I priced it and it ends up that I can get Maple for almost the same (high) price. Have you used the veritas vise enough yet to know if you like it or not? Wow, great bench. I think it will last a while. -- dnick, North Hollywood, Ca. Love that southern yellow pine. So jealous! Great job! 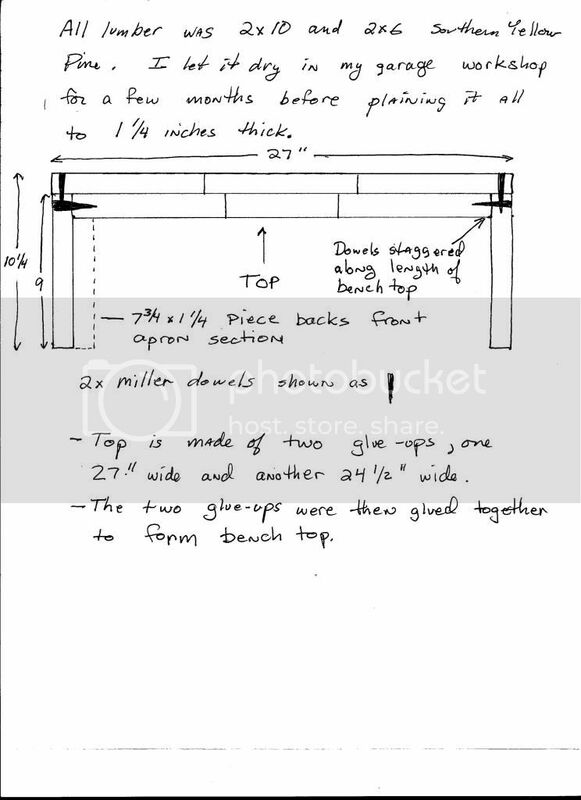 Here are the plans for the bench. Please let me know if you have any questions or need any more detail. Thanks for taking the time to post your drawing’s. I am going to start getting the wood together and copy your plans. I hope you don’t mind…I won’t if you do. Again thanks for sharing such a great project. Feel free to use them. Good luck. Great looking bench Tim! I especially like that piece of walnut on your bench top! Did you saw that your self?